Even with the establishment of trained, regulated Royal College of Dental Surgeons (RCDS) dentists, in 1889 many dental practitioners were still advertising in newspapers and on billboards, making dubious claims of superiority over other dentists, while charging fees that were too low to provide proper care. Even worse, in spite of their best efforts, the Ontario Dental Society and RCDSO struggled to stop large numbers of illegal, untrained dentists from practising in Ontario. With the image of the dental profession again tarnished, the need for a Code of Ethics was apparent. It was from this crisis that the Ontario Dental Society gathered at the Masonic Temple in London, Ontario, and drafted a Code of Ethics. 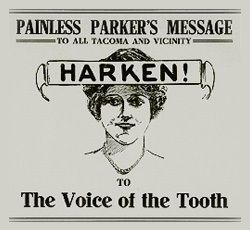 Adopted in the summer of 1889, the Code banned newspaper and handbill advertisements, the promotion of discount services, the advertising of free teeth extraction on specific dates, and any claim of a dentist’s superiority over other dentists. Violation of the Code of Ethics would result in expulsion from the society. The Code virtually eliminated dishonest professional advertising in Ontario. Learn more about The Code of Ethics in the pages of Ontario Dentist: The Journal of the Ontario Dental Association.